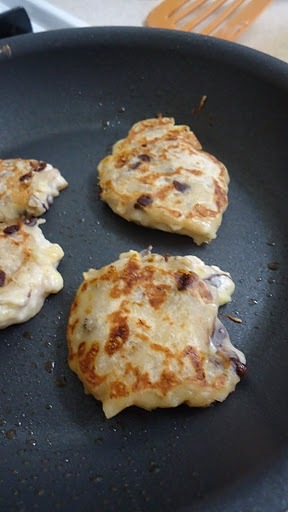 Healthy Snack Wednesday: Banana Walnut Chocolate Chip Fritters!! Confession: I almost skipped this week’s Healthy Snack Wednesday post. True story. My sister is coming to visit tomorrow, so this is the night that Ry and I finish cleaning the house. So after cooking an AMAZING dinner (Pom Wonderful braised chicken, recipe will be up soon) and cleaning for a few hours, I didn’t feel like messing the kitchen up, or cooking. 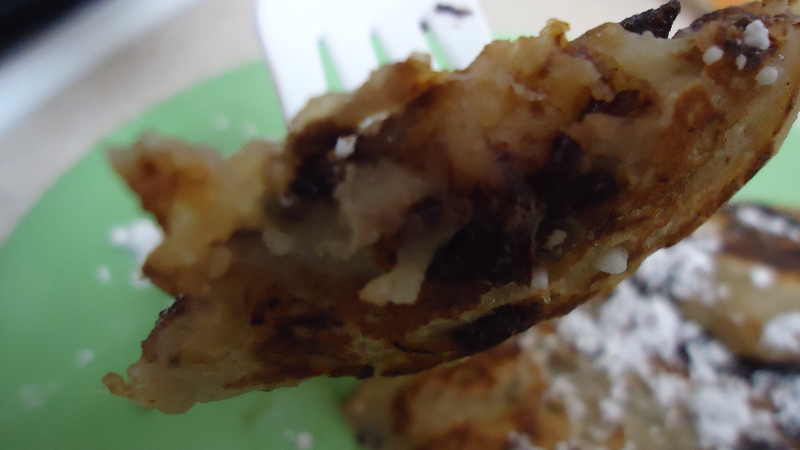 Lucky for you my faithful readers, I got a craving….I wanted fried bananas. This is our easy go-to night-time snack. 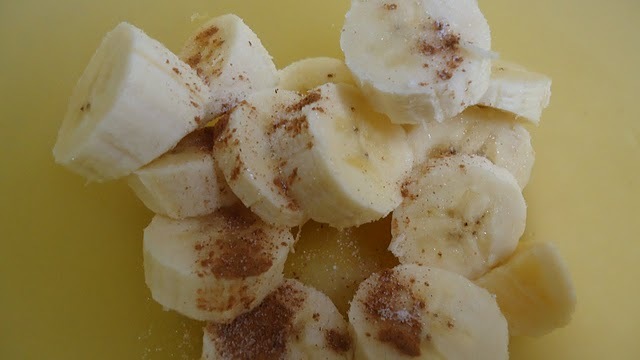 You spray a pan with cooking spray, heat it up, throw in some banana slices and brown them up. Walla! Delicious. But worthy of a blog post….eh…. Then Ryan got a craving, for banana “freehos” as he calls them. I think he means my banana fritters. Well I wasn’t about to get that crazy in the kitchen. So I compromised. Grabbed a little of this, a little of that, and a new delicious, healthy night-time sweet snack was born! I don’t know if fritters is exactly the right name. 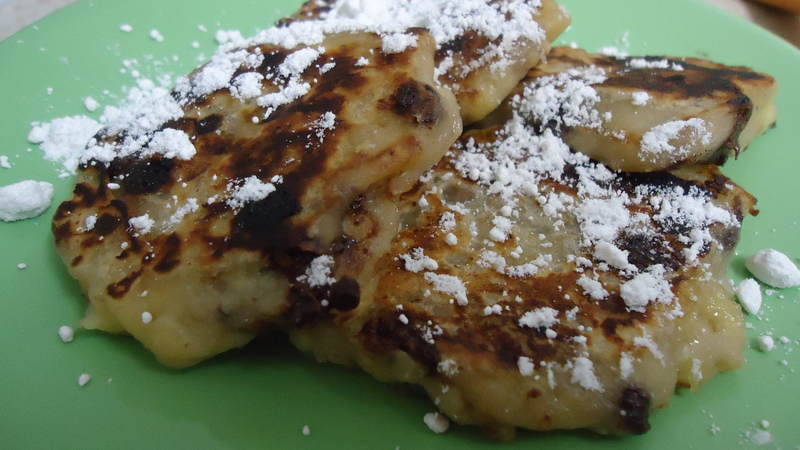 It was kind of a mix between a fritter and a pancake, but we’ll go with it. I sprinkled ours with a little powdered sugar, but they would have been great with some fresh strawberries and a little whipped cream on top! Remove from pan and top with whatever you like! 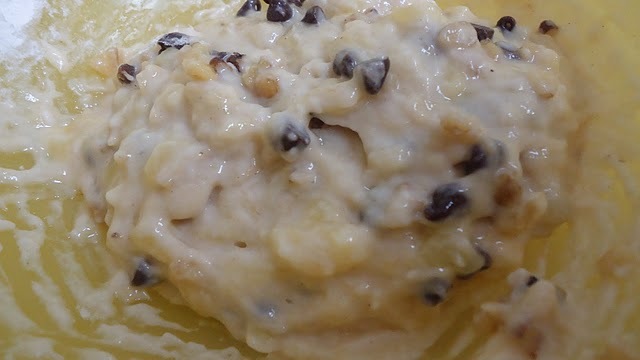 This entry was posted in Recipes and tagged banana, dessert, healthy, recipe, snack by reneeh. Bookmark the permalink. Yum! I have some bananas downstairs that would be perfect for these. This would definitely make a great after-dinner snack! Oh my gosh! I will be making these tonight when I get home. Ended up making a chicken w/ vinegar and roasted veggie salad last night after our FB talk of chicken marinades. Thanks for the inspiration yet again! Oh yeah, definitely making these. They look so good!! I have exactly ONE banana left in my apartment. I think I know what’s for dessert tonight. Thank you! This is the kind of healthy snack I would make for breakfast!